Forrest went to the front of the net twice, scoring a power-play goal in the first period and the deciding tally with 12:42 left, not two minutes after the No. 3 Jesuits got on the board. “When you go to the net, good things happen. You’re able to put in those garbage goals off the wall, and that’s how you win those games,” Forrest said; it was a physical game between two teams who could well be there for the CIAC Division I final on March 19. Ridgefield re takes less as Forrest scores his second of the game. Sean Gordon made 22 saves, with a couple of huge stops on Matt Wenger on a long five-on-three in the second period. The Jesuits (8-8) came out putting bodies on Forrest’s wingers, Nicky Cullinan and Matt Walker; Walker drew two penalties, and the Tigers scored on an interference penalty that Fairfield Prep took while on a power play of its own. “Ehh,” Jesuits coach Matt Sather said to that. “We played silly for two periods, running around like — silliness. The Tigers got it back quickly. Cullinan fought through a hit behind the Jesuits net and got the puck to Walker. Walker’s shot went wide but caromed off the endboards to Forrest to put home. Forrest took a hit after the puck trickled in and needed a few seconds to get up. He’d taken another hit up high with 1.5 seconds left in the second period going hard to the net. Forrest scored on a power-play rebound 9:19 into the game as the Tigers controlled the first period. 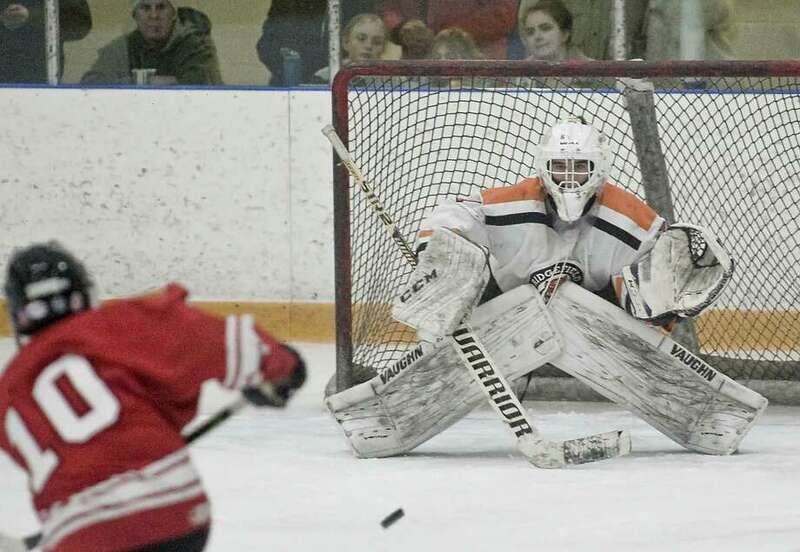 Ridgefield won the teams’ first meeting on opening night Dec. 12, 5-2. No CIAC team has finished a regular season unbeaten since New Canaan went 20-0 in 2010-11. No unbeaten team has finished the job with a CIAC championship since Enfield in 1982-83. The Tigers face Division III Wilton on Friday and Division II Westhill/Stamford on Monday. Ridgefield is now 18-0-0 on the season. An undefeated season is pretty close to happening. Records: Fairfield Prep 8-8; Ridgefield 18-0. Goals: FP—Colin Bella; R—Will Forrest 2. Assists: FP—Calyb Reeves; R—Matt Walker 2, Kees van Wees, Nicky Cullinan. Goalies: FP—Jake Walker (23 saves); R—Sean Gordon (22). Shots: FP—23; R—25.